The price of oil is as low as it has been for a while but the oil companies have simply jacked their prices up and the government will not do anything as they rake in extra VAT for every increase. We are hitting 118.9p a litre in some areas now and soon we may be faced with paying £1.50 a litre. The proposal offered below makes MUCH MORE SENSE than the ‘don’t buy petrol on a certain day’ campaign that was going around last April or May! The oil companies just laughed at that because they knew consumers wouldn’t continue to hurt themselves by refusing to buy petrol. It was more of an inconvenience to us than it was a problem for them. With the price of petrol going up more each day consumers need to take action, especially now that the oil companies and the OPEC nations have conditioned us to think that the cost of a litre of petrol / diesel is CHEAP. Perhaps we need to take aggressive action to teach them that BUYERS control the market place not sellers. The only way we are going to see the price of petrol or diesel come down is if we hit someone in the pocket by not purchasing their petrol or diesel! For the rest of this year DON’T PURCHASE ANY petrol from the two biggest oil companies (which now are one), ESSO and BP. If they are not selling any petrol they will be inclined to reduce their prices. If they reduce their prices the other companies will have to follow suit. However, to have any effect this must be undertaken by millions of Esso and BP petrol buyers. This is the catch but it really is simple to achieve this! Millions of consumers can be easily reached if everyone sends this e-mail to at least ten more persons. This can quickly snowball if every recipient sends it to a further ten persons. After six generations of this action over THREE MILLION consumers will have been advised. If those three million pass this on to ten friends each, then 30 million people will have been contacted and so on until there becomes a prospect of THREE HUNDRED MILLION PEOPLE involved in the chain! All 300 MILLION consumers could conceivably be contacted within the next 8 days!!! Acting together the public can make a difference. If this makes sense to you then please pass this message on. It’s easy to make this happen. Just forward this email, and BUY your fuel at Shell, Asda, Tesco, Sainsburys, Morrisons, Jet, etc. Who knows, you might even realise that there’s a world outside of the pollution-filled metal box that you spend so much of your life in. I can see a few flaws in the email. What about countries where one or both of the companies are not represented? Finally, I doubt very much that even half of the people that receive the email and are in a position to react will do so. Hahahaha! Excellent idea – I’m booking my ferry tickets today! I’m already buying my fuel from the cheapest supplier in the district. What these people seem to fail to grasp is that, according to the RAC, the cost of motoring is cheaper than it was 20 years ago to the tune of 18%. The inconvenient truth is that motoring has never been cheaper. If the cost of motoring is truly hurting then I think we’d see the evidence in a marked reduction in the volume and speed of traffic. I don’t think that I see that evidence in my 50 mile daily commute. Quite the reverse, in fact. Finally, I thought that the laws of Supply and Demand ultimately dictated prices, not just the buyer. But I’m no economist, so I could be wrong. I should have emphasised that motoring is 18% cheaper IN REAL TERMS than 20 years ago. I find it it bizarre that some motorists so obviously feel they are oppressed when as Westfield Wanderer points out they have never had it so good. It is as if the lobbying from environmental and cyclists’ organisations has provoked a reaction in advance of the needed action. 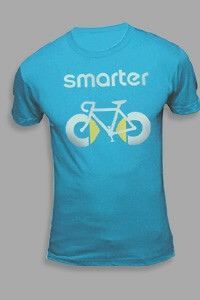 If only the “Smarter” T-shirt came smaller. I’d love to wear that around Stuttgart. Facebook just suggested I join the group “petition for 80p a litre petrol”. Bless them, they’re clueless, aren’t they? 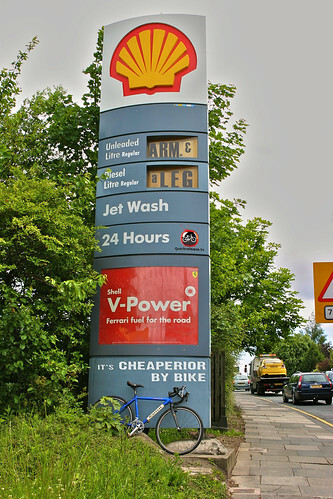 “Petrol now marginally more expensive in absolute terms than it was 2 years ago, which actually means that it’s still cheaper” – crap headline, but accurate.